Ninety three pictures this week. 93. Apparently I was a little camera happy this week, but I will not be showing you every single one, so you can relax. :) I will however be sharing a little something fun that I pulled together for Kaleb as a Tot Tool, so hang on 'til the end! 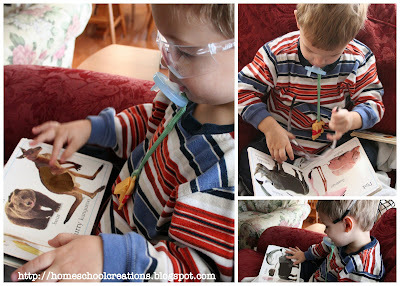 Kaleb love the DK books, especially the Touch and Feel: Animal Colors right now. The pages are all sorted by different colors and show animals that are that color. One of the animals on each 2-page spread is tactile, which he loves! There are very few "big-kid" games that Kaleb can play along with (without much frustration on the older kids part). 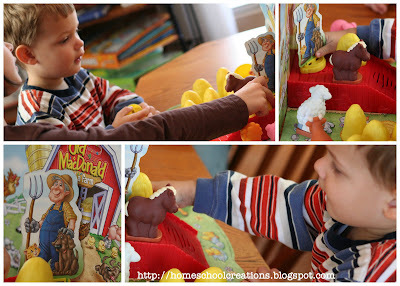 Laurianna decided that she wanted to play Old McDonald (a game I recently picked up for $0.25 thank.you.very.much). Kaleb loves hearing the different animal sounds and it's a great way for us to practice our animal names and sounds. 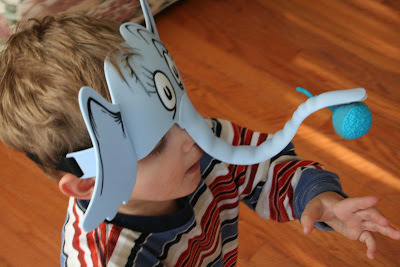 Another new favorite game in our house is Horton Hears a Who! - You to the Rescue! - one I picked up on clearance after Christmas at Target. The kids have so much fun hiding the little "dust specks" and it's too fun watching them try to pick them up with the Horton nose. Makes for some fun pictures too! This week it snowed again and while the older kids went outside to play, I distracted Kaleb with some other table activities. He's still had a pretty rough cough, so inside seemed a little better for him. 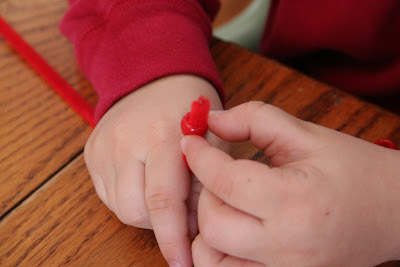 During that time we had fun putting beads onto pipe cleaners. Then I found an activity that kept Kaleb happy for an entire hour. 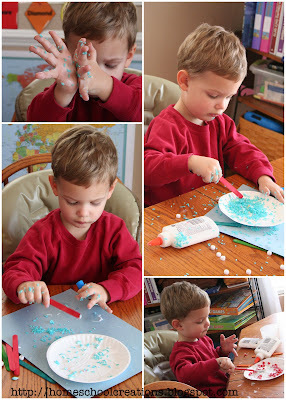 A bottle of glue, colored rice, many beads and complete stickiness later, he had a lovely messy masterpiece. 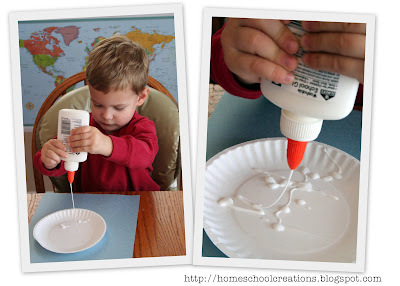 I have lots of little beads left over from who-knows-what, and I was throwing out a Parmesan cheese container this week I thought it might be a great fine motor activity for Kaleb to drop the beads into the container one at a time. He loved it. 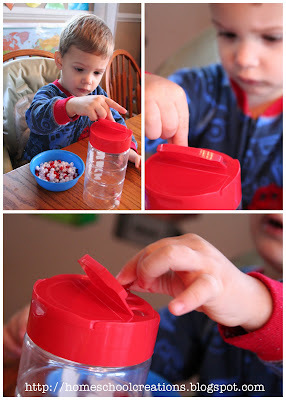 He would get between 10-15 in and then I would close the lid, he'd have fun shaking it, and then ask me to open it back up. He'd dump out all the beads and start over again. The most fun was spilling the beads all over the floor! There were other activities this week too, but I'll leave you with the Tot Tool that I created this week. I made a Color Matching game for Kaleb (you should be able to print it off from the link below). There are 10 colors/sheets with 6 cards on each sheet. Each color sheet has the 'base' color and then 5 picture cards of an item that match that color. I printed them off and laminated them to make them a little sturdier for his hands to hold onto (and also they will survive longer in our house). I'm only giving him 2-3 colors to use at a time and spread the pictures out on the floor. Then I show him the 'base' color and he finds me a picture that matches that color. 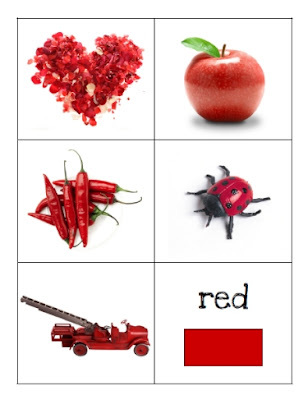 Click on the sample image from the cards below and it will take you directly to the pdf file. That's it for this week! 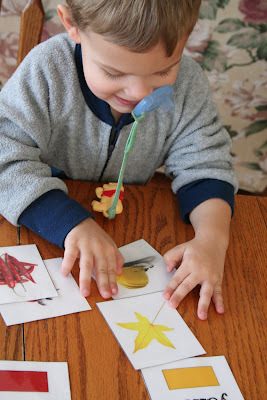 I'm working on some other Tools for (my) Tot too, so be sure to check back later! I love the color cards. I will be printing these and doing them with Girlygirl really soon. I love the color matching game. I downloaded it and can't wait to use it when Smiley is a bit older. I, too, love the color matching cards. I will also be borrowing your Parmesan Cheese/bead idea! We have that same old macdonald game from a garage sale. Sweetpea loves it.